Every Ironman® is unique — even races in the same location with the 17-year history like Lake Placid. And this year’s edition of the race simply did not disappoint. From an incredible Team Endurance Nation presence to the pre-race drama of a fire in town to the evil heat on the run, it was an epic day. Congratulations to all 41 Team Endurance Nation finishers for reaching your finish line! Derek Sanks with a 45-minute plus personal best! Natalie Pilon with personal best 12:47 finish! TeamEN takes First Place Tri Club! One of the best parts of race week is a chance to reconnect with old friends and make new ones. Seeing as Ironman® Lake Placid was a TeamEN Key Race this year, we had quite the contingent of members new and old. Dinner was a great chance to connect with one another and have some fun before the nerves of race week truly set in. Friday was our Four Keys Talk, well attended and supported by our sponsors Inside Out Sports gave Free nutrition, discount code for their website and Free compression socks with purchase. As they say they have “Everything but the Engine” and because of that, Endurance Nation athletes enjoy year round discounts and deals from Inside Out Sports. It’s no wonder they are a team favorite. Beet Performer helped sponsor the weekend with Free beet juice for athletes that attended Endurance Nation events. We can’t BEET around the bush, we love Beet Performer (especially the passion fruit flavor) Studies have shown that beet juice increases athletic performance and improves stamina and strength in endurance athletes. EN athletes enjoy the sponsors upBEET attitude and support of the team with wonderful discounts. The Four Keys of Triathlon Race Execution and Complete Lake Placid Course breakdown is a staple for the community and the team. 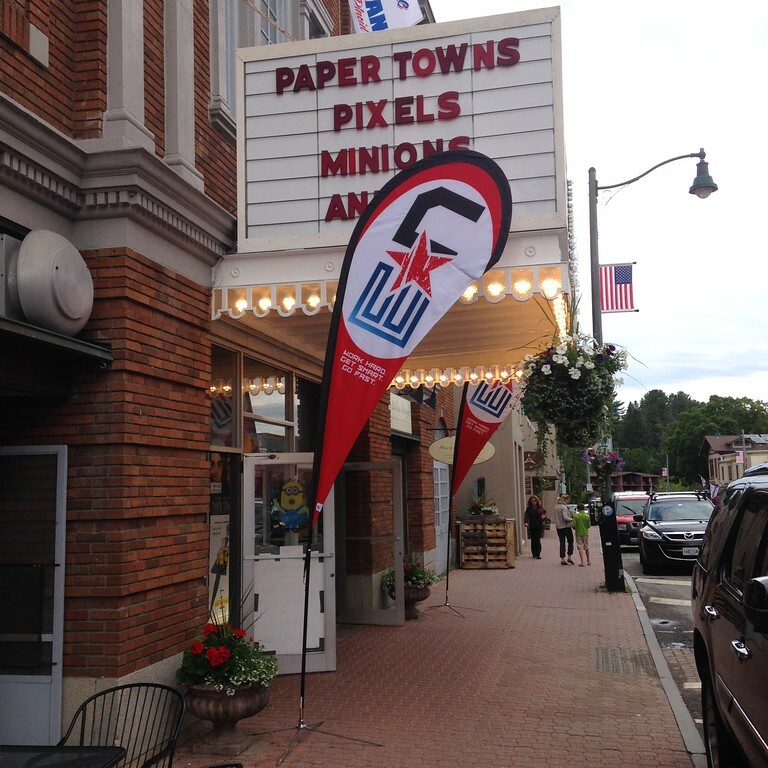 Held at the Palace Theatre in downtown Lake Placid, we look forward to educating athletes towards the best race day they can have. While everyone was busy checking the weather on Saturday, a fire broke out on Main Street in an apartment complex. For those of you who don’t know the Lake Placid area, it’s built on the side of a hill that drops into a lake. As a result, there are only two stories above main street, but at least two more below street level that overlook Mirror Lake. The fire started around 5pm and took well over six hours to be fully extinguished. Kudos to all the firefighters from Lake Placid and the surrounding towns who cooperated to limit the damage and keep everyone safe. Unbelievably other than some displaced athletes and “smokey” lake water, the race continued without a hitch. Amazing. Race day dawned like so many before…cool, overcast and beautiful vistas of clouds overlaying the surrounding mountains. The water was cool and flat, and perfect for swimming. Over the course of the day, warmer weather rolled into Lake Placid, leaving the lower elevations of the bike course a bit cooler than race central. By the time the run came around it was officially warm…and warm quickly became downright hot between 2pm and 6pm. While there were tons of clouds in the sky, none of them blocked the sun. Athletes were treated to a bit of shade on the out and back section of the run on River Road, but that was really it. Once again, Ironman® Lake Placid was a wave start. Without a professional field, there was no need to accelerate the swim start or create a “pro only” swim lane inside the buoys. Athletes had the chance to warm up, and then self-seeded by 10-minute increments. Once the race started, the athletes were shuttled forward by group. When they reached the front, the racers simply walked forward and started swimming right after they crossed the mat. By all accounts it was your typical swim — some contact, but just as fast as usual. The water was flat and perfect for swimming. The quality of the road remains quite high from the 2014 repaving effort. In fact, road crews spent the better part of Friday — two days before the race — patching some of the cracks and divots that had appeared on the second half of the descent and the out and back section to Ausable Forks. As noted earlier, Placid was warmer than the lowlands, and as such the convection made for a headwind on the way out of town (the descent) and a tailwind on the way back in (the climb). As a result, the bike was pretty favorable unless you didn’t have good climbing ability — for as the road went up, it was getting hotter and you were moving more and more slowly. During the race I went for a run and watched many of the lead men finish their first loop. It was clear the race was fast given their times (on pace for a 5 hour bike) and their choice of gears — big! Most of the top ten were riding at 75 rpm or lower…a mistake which many of them would pay for by the time they were on the run. Based on reports, the course was fast but dangerous spots still remained. There were quite a few aid station accidents (including two for TeamEN athletes!) and several ambulances sighed returning from the short out and back on Haselton Road — another fast section with a slightly downhill aid station. Hopefully that layout will be revised for next year’s race. Yes, That’s Blood on My Knee! While the first few miles of the Lake Placid run course are net downhill, it’s no cake walk and you could tell right away who was feeling good and who was in survival mode. Running downhill of the bike in an Ironman® is just as hard as running uphill, and it showed. Add in the effect of the heat, and it was clear that getting soaking wet and staying cool would be a critical part of any successful race strategy. Of course, if you were behind nutritionally coming off the bike, you were pretty much resigned to being in survival mode. Even early in the race there were reports of athletes walking out on the flatter sections of the run, having bravely run past all the fans at the start (aka closer to town). Our Endurance Nation athletes were all on point, with many of them opting to use heart rate for proper pacing given the conditions. All of them struggled in the heat, yet some were still able to dial in phenomenal performances considering the conditions. The thermometer said it was a high of 84 but my skin felt like it was on fire. To put it another way, I was super glad to be standing in the shade of a tree instead of racing!!! As the race wore on, it was time to head to the finish area to connect with our Team and learn more about their races. There’s no hiding at the end of the race — sheer exhaustion prevents embellishment and the clock tells no lies…these short interviews are some of my favorite interactions with our members. It was off to the Lake Placid Brewery for a few beers and to carb up from 9pm to 11pm, before we headed over to the finish line to cheer in our teammates and watch the final finishers achieve their Ironman® dreams. It was an epic day for certain…every single one of you is an Ironman®! Congrats to you all and hope to read your reports online over the coming days and weeks. Happy recovery!